FMiner can download files assigned in "capture content". But sometimes, we just can scrape URLs of files. For example, when the image URLs in "style" of HTML code, we can extract their links, but can't download them when extraction. Or, we would like to scrape data at first, and download the files later. We can use this tool to download files from URLs in data table after extraction. Select a column with the URLs you want to download. 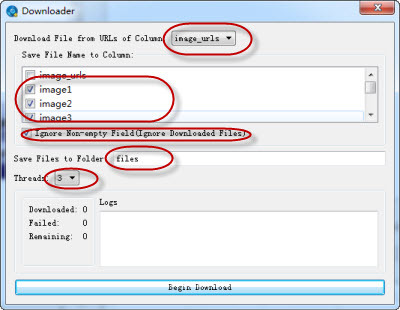 The column can have more than one URLs divided by newline, downloader will try to download them and save files names in selected columns of "Save File Name to Column". Select column(s) to keep the names of downloaded files. Ignore Non-empty Field: When the selected column(s) of a row is non-empty, ignore this row and not try to download URLs of this row. This option is very useful when we stopped downloader, or scraped some new data. we can check it, and "run downloader" again, it will ignore the downloaded new files. Which folder the downloaded files will be saved. Threads to download files. You can change it bigger to make it faster.